'Girl In The Blue Bra' Symbol Of Egypt's Ongoing Strife : The Picture Show The image has become the rallying cry for thousands of Egyptian women who marched in Cairo demanding the end of military rule. Beyond Egypt, the content of the image was recently condemned by Secretary of State Hillary Clinton, who said, "systematic degradation of Egyptian women dishonors the revolution, disgraces the state and its uniform, and is not worthy of a great people." There have been countless accounts of violence recorded during the uprisings in Egypt, but the image that perhaps has captured the most attention is the most recent. The image has been widely referred to as the "girl in the blue bra." Egyptian army soldiers arrest a female protester during clashes at Tahrir Square in Cairo on Dec. 17. 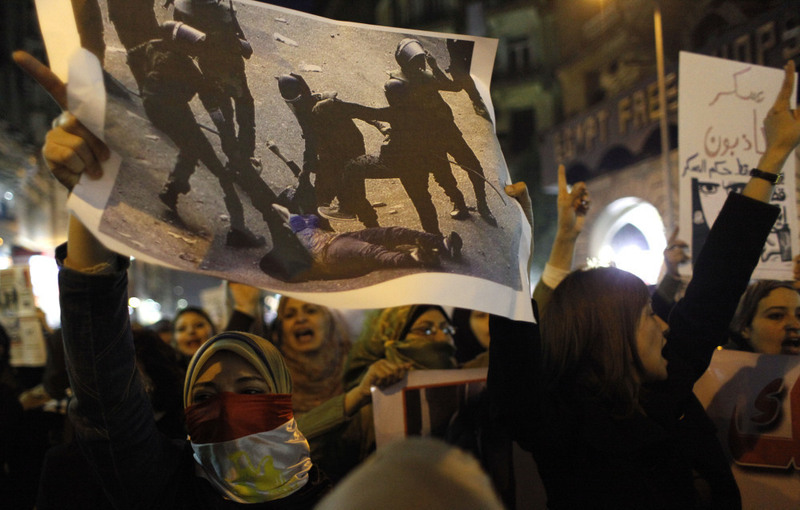 A veiled young woman is dragged and beaten by Egyptian military during a protest in Cairo's Tahrir Square. Her face is covered. Her torso is bare, except for her bright-blue bra; she's a millisecond away from being kicked by a solider. The image quickly became a visual symbol of abuse of power by the Egyptian military. It also became the rallying cry for several thousand Egyptian women who marched in the country's capital on Tuesday demanding the end of military rule. Angered by recent violence against them in clashes between army soldiers and protesters, Egyptian women — one carrying a poster with a picture of a woman who was assaulted by soldiers — chant anti-military slogans during a rally that ended in Cairo's Tahrir Square on Tuesday. U.S. Secretary of State Hillary Clinton said in a recent speech at Georgetown University that the image showed the "systematic degradation of Egyptian women [which] dishonors the revolution, disgraces the state and its uniform, and is not worthy of a great people." In response to Clinton's condemnation, Egypt's state Middle East News Agency quoted Foreign Minister Mohamed Kamel Amr as saying Egypt would not accept any interference in its internal affairs on the way security forces dealt with female protesters. And today there are reports that Kamal al-Ganzouri, Egypt's military-appointed prime minister, has called for a national dialogue to resolve the country's crisis and for a two-month calm to restore safety. While images and stories of women's-rights abuses are not hard to find, Kenny Irby, senior faculty for visual journalism at the Poynter Institute, says the image has become an icon for the sexist and brutal use of military power because "the frame captures the horror of excessive abuse which has elevated its status." But beyond the brutality, Irby says, "it has an aesthetic punctuation that is the blue bra." "It has the clear suppression of female rights but also has the visual stamp which has historically been part of women's liberation protests [in America]." Canada's National Post reported Egyptian blogger Fatenn Mostafa tweeting, "The blue bra is unforgettable and we all become 'the blue bra' girl one way or another." Irby points out another important factor — the fact that the image is not a still frame captured by a camera but a frame grab from amateur video footage. "We are at the point where consumers of information are not vetting the fact that it is a video or a still," Irby said. He adds that in today's fast-paced media cycle, "the masses would rather have the image and then later vet the credibility." The veracity of this video's content cannot be denied, however, and Irby notes that the frequency of media outlets' proliferating images and video created not by professional journalists but by "authentic witnesses" is higher than at any point in history. "This image now has the potential to impact national policy, and that has been one of the major attributes of photojournalism — images that move the hearts and minds of the public and policymakers," he said.